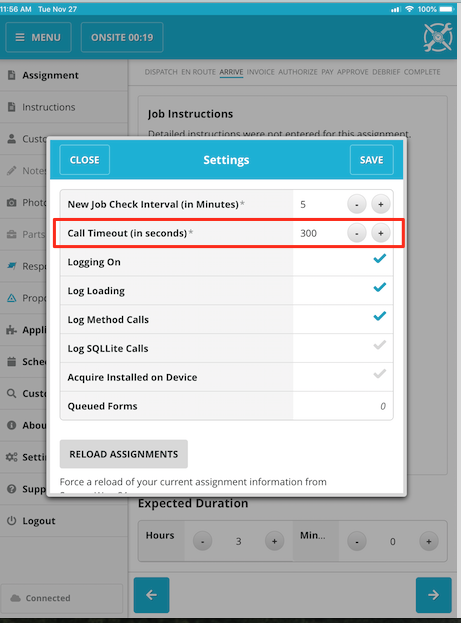 The "Call Timeout" option, inside Settings controls how long it will take for a data transmission to time out. It defaults to 300 seconds, which is 5 minutes. If you are in areas of poor coverage and would like your device to time out sooner, you can set it as low as 30 seconds. We recommend you keep it at the default of 300 seconds, as if you set it too low it could prevent you from being able to submit your data successfully, specifically in cases where you have a large invoice.